Guy Clark doesn't just write songs, he crafts them with the kind of hands-on care and respect that a master carpenter (a favorite image of his) would have when faced with a stack of rare hardwood. Clark works slowly and with strict attention to detail -- his output has been sparse since he first signed to RCA in the early '70s -- but he has produced an impressive collection of timeless gems, leaving very little waste behind. His albums have never met much commercial success, but the emotional level of his work consistently transcends sales figures and musical genres. He remains the kind of songwriter whom young artists study and seasoned writers (and listeners) admire. Clark was born in the West Texas town of Monahans, where he was raised mostly by his grandmother (his mother worked and his father was in the Army), who ran the town hotel. One of her residents was an oil well driller who would later end up the subject of one of Clark's most moving and stunningly beautiful songs, "Desperados Waiting for a Train." Many of Clark's songs, in fact, have centered around his days growing up in West Texas, including "Texas 1947" (from his debut album) and the 1992 song "Boats to Build," which hearkened back to a summer job he once had as a teenager on the Gulf Coast. The first songs Clark learned were mostly in Spanish. Later, when he moved to Houston and began working the folk music circuit, he met fellow songwriter Townes Van Zandt (the two often toured together until Van Zandt's death in 1997) and blues singers Lightnin' Hopkins and Mance Lipscomb. It was here that Clark began playing and writing his sturdy brand of folk- and blues-influenced country music. In the late '60s, Clark moved to California, living first in San Francisco (where he met and married his wife Susanna, a painter and songwriter) and then in Los Angeles, where he worked in the Dopyera brothers' Dobro factory. Tiring quickly of Southern California (sentiments he expressed in another of his classics, "L.A. Freeway"), he and Susanna packed up and headed for Nashville in 1971, where he picked up work as a writer with publishing companies and, eventually, a recording contract with RCA. Clark's first album, Old No. 1, came out in 1975, a few years after Jerry Jeff Walker had turned "L.A. Freeway" into a minor hit. By this time Clark was considered one of the most promising young writers in country music, and while he didn't live in Texas anymore, the state's influence still ran thick in his blood. Clark recorded one more album for RCA, Texas Cookin', in 1976 before switching to Warner Bros. for his next three albums, released between 1978 and 1983. Three of his songs from these albums cracked the Top 100. By the mid-'80s, however, a number of his songs had been made into hits by country stars such as Johnny Cash, David Allan Coe, Ricky Skaggs (who took "Heartbroke" to number one), George Strait, Vince Gill, and the Highwaymen. Clark continued to work as a writer but didn't record again until 1988's Old Friends, released by Sugar Hill. He then switched labels once more, this time to Asylum, which released his 1992 album Boats to Build as part of their acclaimed American Explorer series. His eighth album, Dublin Blues, came out in 1995, and among its finely crafted moments is a re-reading of one of his most enduring songs, "Randall Knife," about the death of his father. Cold Dog Soup followed in 1999. Clark released Dark in 2002, followed by Workbench Songs in 2006. The DVD Live from Austin, TX arrived the following year. A much needed survey of Clark's key songs covering the years 1975 to 1995 called Hindsight 21-20 appeared from Raven Records late in 2007. His 11th studio album, Somedays the Song Writes You, arrived in 2009. 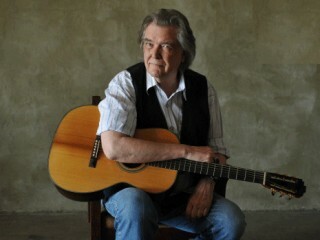 View the full website biography of Guy Clark.